When a severe storm is in the forecast, most of us head to the supermarket to load up on supplies. And as last year’s hurricanes in Texas, Florida and Puerto Rico demonstrated, the standard recommendation of a three-day stockpile might not be enough. 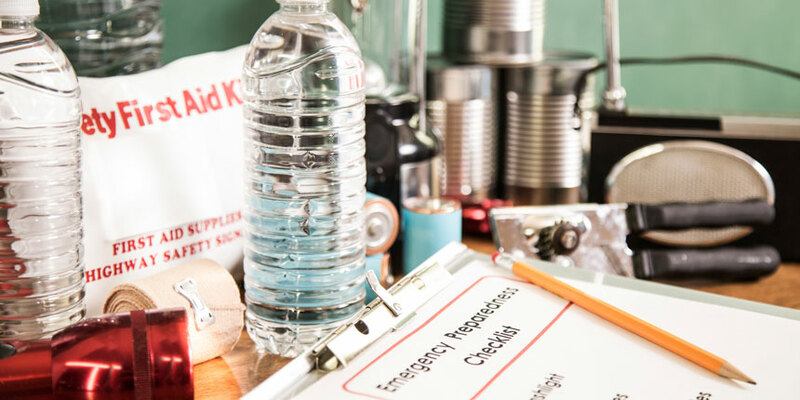 In fact, some experts suggest preparing for an emergency lasting a minimum of 72 hours and as long as 10 days. This is the most important supply. Plan for one gallon per person per day. Canned soups, vegetables, beans, chili, fish and poultry can be good choices, as long as they are marked low in sodium. High-sodium foods are not only bad for heart health, they will make you thirsty at time when water is limited. Also, look for tuna and other fish packed in water, rather than oil. Choose products that have no added sugar, sweeteners or other additives. These fruits can stay fresh without refrigeration and are full of vitamins. In addition, apples and oranges will help keep you hydrated. These meats won’t spoil without refrigeration, but the high sodium can increase your thirst. This is a good time to stock up on powdered milk and boxed milk and juices. They won’t spoil if you lose power and refrigeration. Granola, trail mix and energy bars will fuel your body for shoveling snow in cold temperatures. These are a good source of protein, but avoid nut butters that contain added sugar and partially hydrogenated oil. Whole grains are higher in fiber and nutrients. When selecting whole-grain cereals, make sure they are low in sugar. Your pets will stay fed even if you lose refrigeration. Stock up on baby formula, high-nutrition shakes for the ill or elderly, and any special foods required by patients with diabetes or other conditions. Make sure you have more than a week’s supply of the medicines you rely on. Ask your doctor or pharmacist about medicines that must be refrigerated, in case you lose power. Hand sanitizer and moistened wipes will help you keep clean even when water is limited. A bottle of unscented liquid chlorine bleach will help you keep your surroundings clean and sanitary. Also stock up on toilet paper and paper towels. If there is no running water, disposable plates and utensils will keep dirty dishes from piling up. As long as you are at the store, pick up extra batteries and flashlights. A solar charger for your phone and a battery-operated radio will be welcome if the power goes out. Also, having canned cooking fuel and long stemmed matches or a lighter on hand will help you heat up canned goods without electricity.